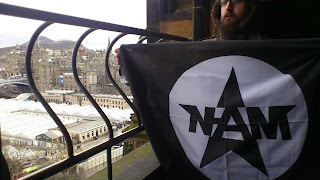 As part of the InternationalNational-Anarchist Movement (N-AM) Day of Action on March 16th, 2013, the Shropshire group's Neil Hiatt took part in a successful leafletting exercise in the old town of the historic city of Edinburgh, Scotland. Here he is, pictured way up in the Victorian Gothic Scott Monument in Princess Street Gardens, where the N-AM flag also flew for all to see. The flag was also flown from the top deck of a bus as it completed a tour of the city itself.